This little art project was super easy. And it was inspired by the Dare to DIY challenge theme this week. 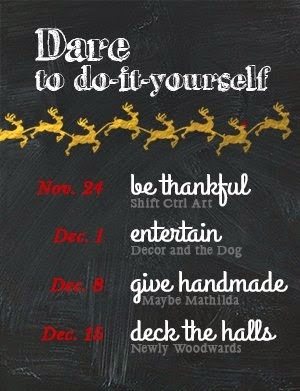 Today kicks off this challenge, with the theme being "Be Thankful," and I'm linking to the party over at the lovely blog, Shift Ctrl Art. 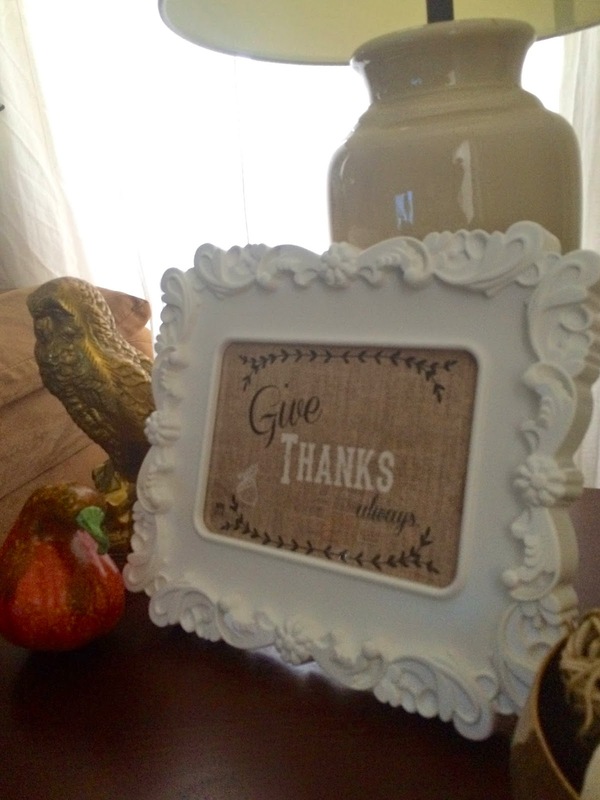 This week the challenge was to create something that reminds you to be thankful, whether it's a banner, homemade art, or anything that spreads the message of Thanksgiving. 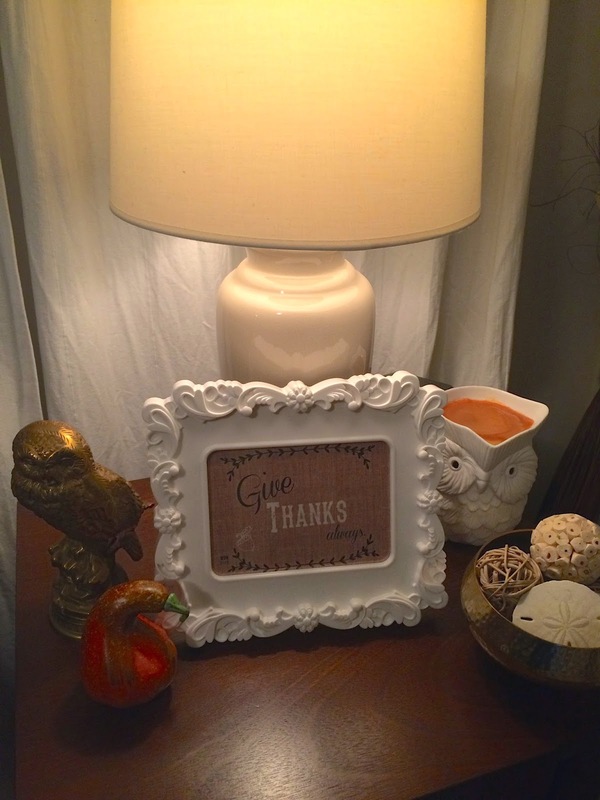 I'm all for a challenge, and any excuse to get crafty this holiday season, so I decided to make my own art for this IKEA frame - which I had sitting on my end table with nothing inside. An empty frame is no way to spread holiday cheer, so I pulled out my handy dandy laptop and my graphics program (InDesign) and whipped up this computer art. That's right, while the texture appears to be burlap, it's actually just printed on computer paper. The background is just a burlap image that I found online just by searching "burlap" in Google images. The fonts I used are Coneria Script and The Dead Saloon - both free fonts you can download online. It looks nice during the day, but I had to take some night pictures, too. With the glow of the lamp it just adds to that little warm and cozy feeling in here. Soon it will be time to start decorating the tree! Until then, I'm still enjoying my fall decor for a little longer. Also linked to: Say G'Day Party, Link Party Palooza. That burlap looks so realistic and I love the frame! Really pretty! Love the textured background and it's perfect in your frame. Thanks for linking up to Dare to DIY! You totally had me fooled with the burlap background. It looks so realistic and gives it an awesome texture! Beautiful job. And also, I have that same owl Scentsy warmer--isn't it so fun? I love it for the fall. I thought you really did print on burlap. I love your design and that pretty frame just brings it over the top for me. So pretty!! Thanks so much for linking up!! This is so pretty! And classy! Thanks so much for joining in on the DIY fun!